A super crunchy red cabbage slaw or red coleslaw coated in a delicious CBD Oil infused peach salad dressing. This post is sponsored by Diamond CBD. All opinions are my own. CBD – the short form of Cannabidiol is a chemical compound found in the cannabis plant or hemp. There are various species of cannabis that naturally contain CBD. CBD has important medicinal benefits without the psychoactive effect of marijuana, meaning that the consumption of Cannabidiol will definitely not make you feel “stoned”. Thus CBD becomes an appealing option for people in need for the benefits of cannabis products without the risk of side effects like getting high or becoming lethargic or the risk of breaking the law. Almost all CBD oil today comes from industrial hemp, which contains insignificant amounts of THC, and that is the cannabinoid which causes a high. Agricultural hemp is rich in CBD, but has less than 0.03 percent THC, making it perfect for extracting CBD oil. CBD is available in supplement form and it is legal in all 50 US states. Even if you live in a state where medical cannabis is currently not legal, you can still purchase and use CBD. The human body produces some cannabinoids on its own and also has two types of receptors for cannabinoids, which are present in the whole body, many of them being found in the brain. According to several studies the CBD supplements the body’s natural cannabinoids, it strengthens the endocannabinoid system, it seems to direct the body to use more of its own cannabinoids. Cannabis has been used to alleviate symptoms of various ailments for centuries. It was used as a sleep aid, in order to reduce anxiety or as a pain or nausea reducer. All these four complaints are what make CBD oil so interesting for me, as I can barely remember the last time I had an uninterrupted, good night’s sleep, I have to deal with anxiety especially when confronted with larger groups of people, I suffer from regular headaches and from motion sickness, meaning that I cannot be in the car for more than 15-20 minutes without being sick (unless I am driving myself). CBD is also an option for people suffering from inflammation (including arthritis and circulatory-related ailments), psychosis, seizures, spams, depression, stress relief and other conditions. As mentioned above, this post is sponsored by DiamondCBD, a company researching and developing CBD hemp extracts and making them available worldwide. All their products (and there are hundreds of them) include 100% natural, lab tested CBD extracts. As Where Is My Spoon is all about cooking I thought about including one the DiamondCBD products, the CBD Oil into one of my recipes. There is a huge choice of different oils among the DiamondCBD products, from unflavored oils to flavored oils like peach, strawberry or watermelon. The CBD oil can be taken in form of drops or can be used as vapor/vape liquid). And talking about vapor liquid, vape oils are one of the most popular ways to consume CBD. The oil is absorbed directly into the bloodstream through the lung providing instantaneous effect. Perfect for those searching for immediate effect of CBD, ingesting the oil will mean that you will have to wait for about 30-40 minutes to feel the effects of the cannabidiol. Here you will find some of the CBD Vape Oils offered by DiamondCBD. 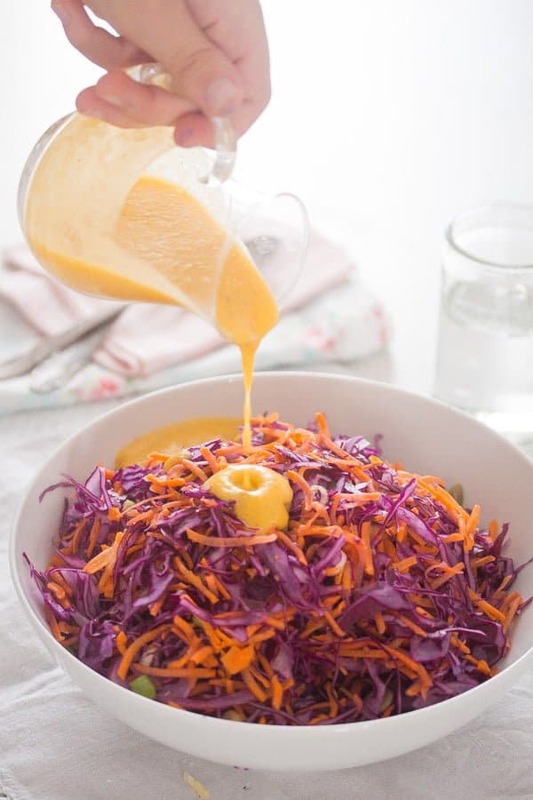 A crisp red cabbage salad with a creamy peach salad dressing seemed perfect for the inclusion of a little CBD oil. I chose a peach flavored oil and I am so glad I did, it fits perfectly into my peach salad dressing. This is a very simple recipe making the most of some good ingredients, a fresh, healthy salad which can only be improved by the addition of some Peach Flavor Diamond CBD Oil. 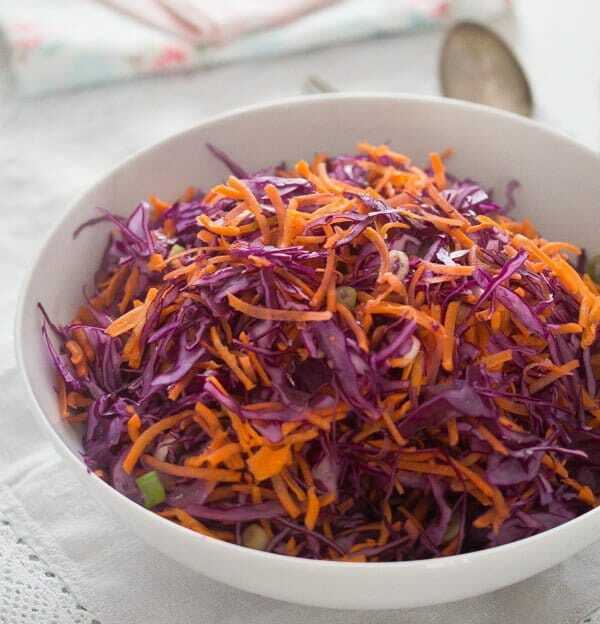 Make the salad by finely shredding the red cabbage and the carrots. Mix them in a large bowl together with the finely sliced scallions. To make the peach salad dressing I used canned peaches this time. Fresh peaches are not available anymore, not now at the end of November, and unless I have very ripe and sweet fresh peaches I prefer to used canned anyway. A good way of ensuring that any meal prepared using CBD oils tastes delicious is to make sure you mix the CBD oil with the fat in any recipe. The fats help to activate terpenes, which provide CBD oils with distinct flavors and scents and other properties, in the CBD molecules, maximizing the health benefits. 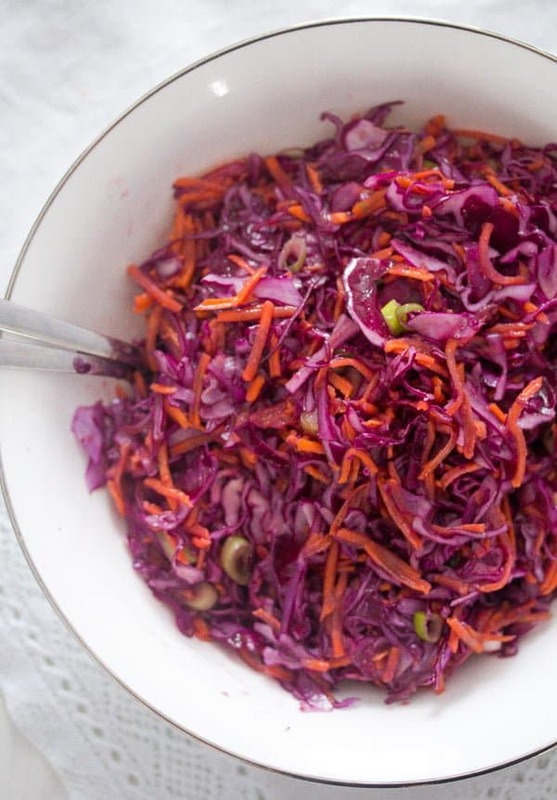 When making the peach salad dressing for the red cabbage salad you will emulsify the regular oil and the CBC oil together with the remaining ingredients. Generally, it is recommended to begin with the smallest suggested dose and increase the dose gradually until it has an effect. Experts recommend starting with 5 to 25 milligrams a day depending on your size and weight. The average person might want to start with 10 milligrams. When it comes to CBD oil dosage, follow this formula: Total CBD (mg) in package/number of suggested servings in package = amount of CBD mg per suggested serving. I suggest that anyone taking this product should decide the right dosage according to their own needs. Should you have any concerns regarding CBD and its effects on your body or should you worry about getting high when using CBD products, I recommend you visit the “CBD Education Center”. 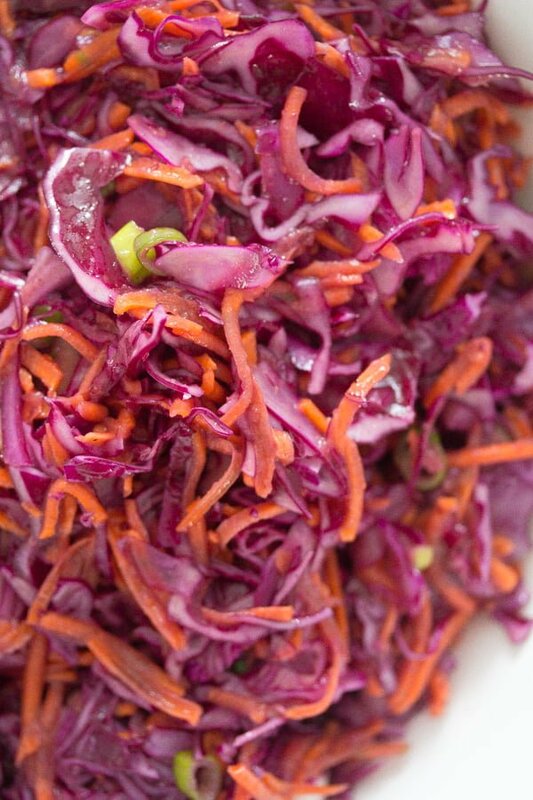 Shred the red cabbage and the carrots very finely, a mandoline slicer works best. Slice the scallions finely. Mix the vegetables in a large bowl. To make the peach salad dressing, give the chopped peach halves, honey, cider vinegar, lime juice, salt and pepper to a small bowl. Add the regular oil and the CBD oil. Blend the dressing with a hand held blender until it emulsifies. Adjust the taste with more lime juice and salt, if necessary. 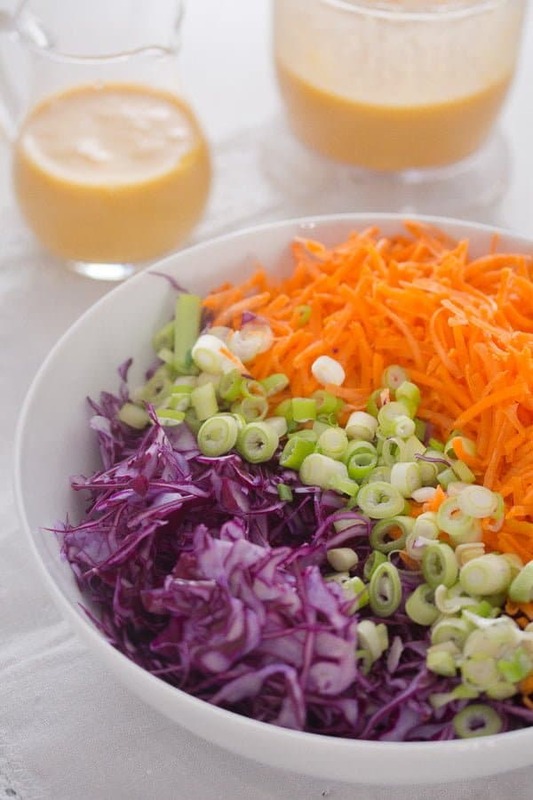 Pour the dressing over the salad, mix well and enjoy. I too suffer from motion sickness…need to get some CBD oil too! The salad looks so colourful and tasty. While I will not use cannabis recreationally, I fully support its use for medicinal purposes for those who need them. As I learn more about CBD oil, I can appreciate its benefits and there seems to be many. This salad looks delicious! 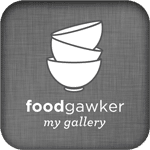 I didn’t realize you can use CBD oil in recipes or that it came in different flavors. Thanks for enlightening me!